Look at today’s post that’s listing down 37 most striking and pleasing vintage DIY home decor ideas if you are a firm believer of living stylishly with things crafted to your own liking and decor ideas that are the fruits of your imagination. Vintage decoration allows one to do up interiors in a feminine sort of way and as per the style that was prevalent during the glorious eras of the 40’s, 50’s, and the 60’s. These showcased home decor ideas will enable you to bring antique feel to your home and are pretty easy to be done. So, lets not waste time and get started exploring the awesome collection of creative home decor ideas with gorgeous DIY accents! We all love to live stylishly, and when planning to decorate on antique or vintage lines, the options open to us are limitless. 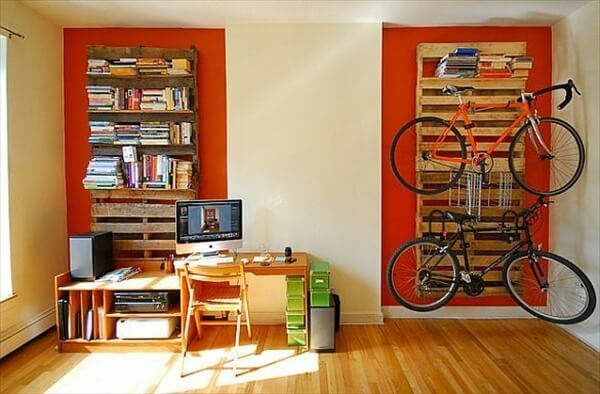 How about using wooden pallets for adorning your living space? 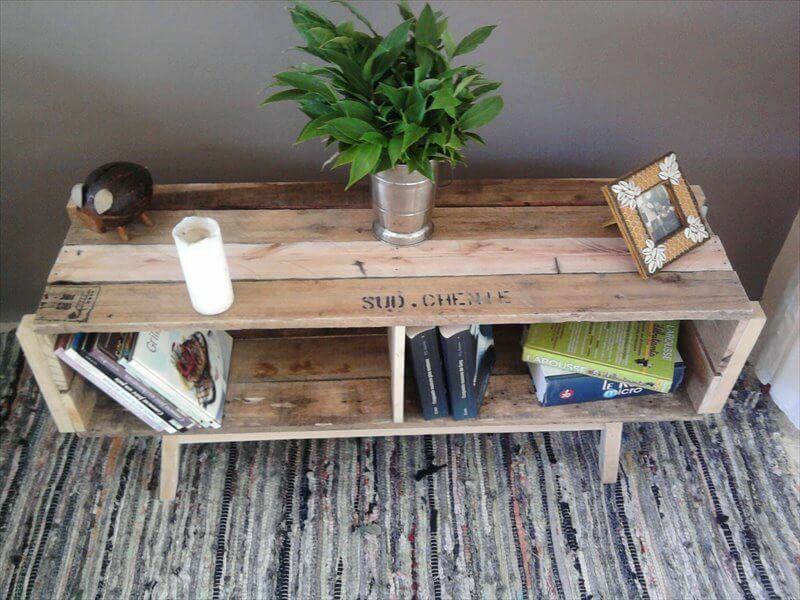 Well, pallet DIY ideas are circulating on many websites these days and all of these are awesome in looks and functionality. Pallets are easily available and are affordable too. 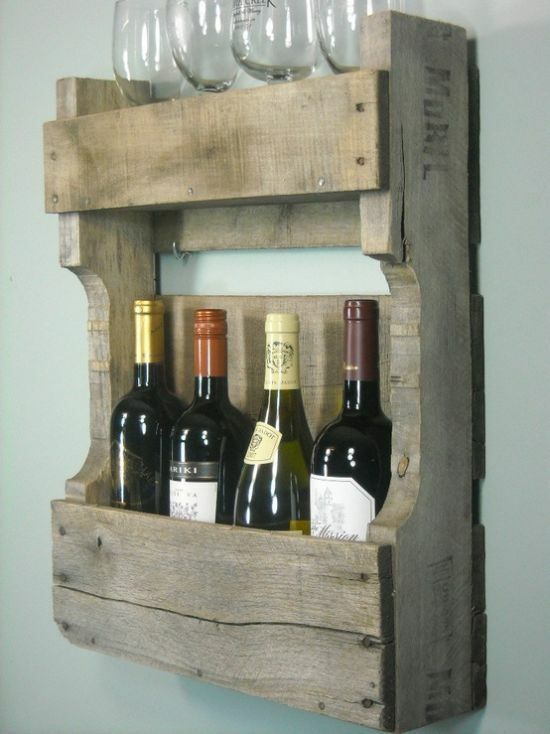 You can create good looking wine holders or racks using recycled wooden pallets, or can also build rustic wooden pallet tables or benches to be placed in your living rooms. 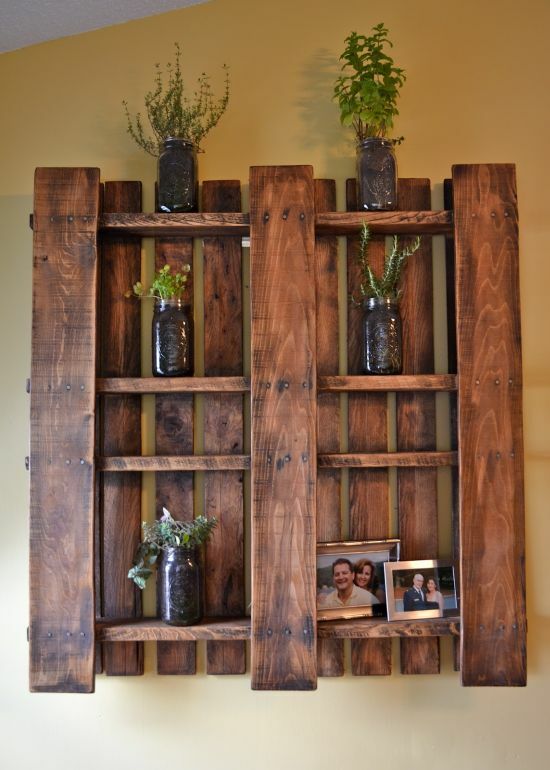 In one particular photograph below, the home owners have hung a very beautiful vintage pallet shelve on their walls for keeping decorative things like herb planters, pictures and pots. 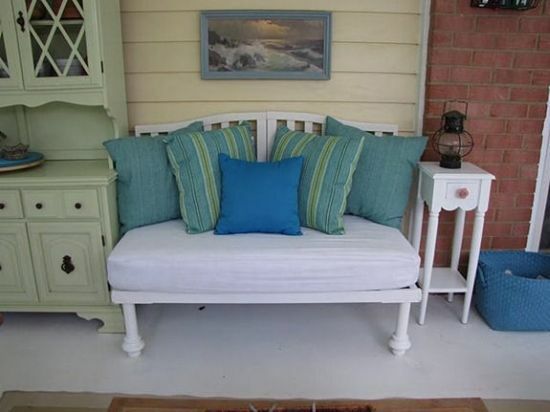 You can take a look at some of the most creative pallet ideas shown below and create handsome nooks and places inside or outside your homes. If you have old baby cribs lying useless in your garage or attic, you can now transform these into lovely functional furniture or decor accessories like we have shown below. Most of the times, we store old and unused items without any purpose or reason. The best way to put these to effective use is to craft newer things out of them. Baby cribs in vintage colors can add chutzpah to your home decor. 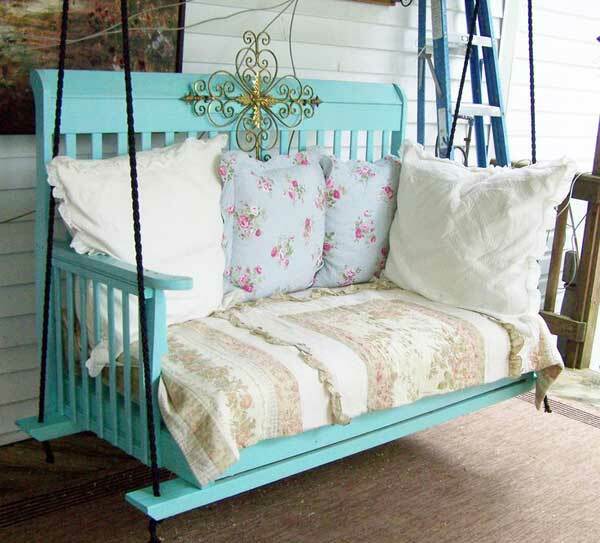 You can craft interesting swings in light beige or pastels and hang these in your porch or balconies. If you need some spice to stylize your living area, you can build crib benches or sofas to suit your decor. Likewise, there are many cool and creative vintage decor ideas that can help you think of ways to add glamour to your interiors. 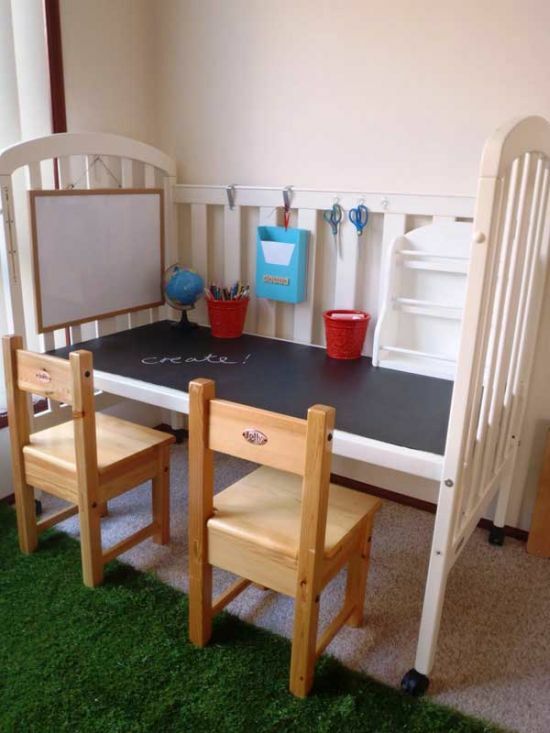 From crafty play tables for your children, storage tables for your crafts room, to creative memo boards for your wall, to artsy wall hangers for your bedrooms, there are numerous ideas to pick. Natural elements always bring in warmth and a feeling of contentment in people’s hearts. That’s why we too suggest that you try embellishing your homes with natural accessories that can be easily procured and are free of cost too. Among them comes twigs and branches of real trees! 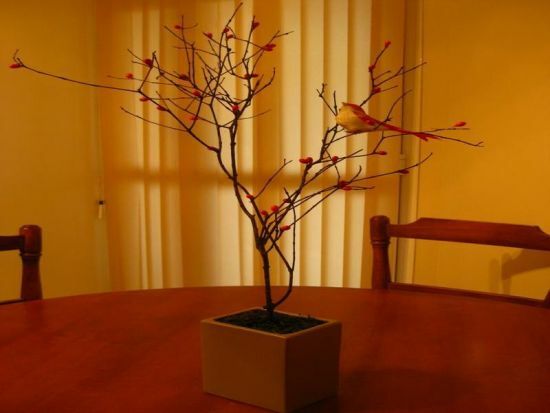 Yes, now a days you can search a whole lot of websites that will show how one can add spice to his or her interiors by crafting decorative pieces out of real twigs and branches. All the creations showcased below are naturally made and are pretty easy to be crafted if you are planning to do the job yourself. 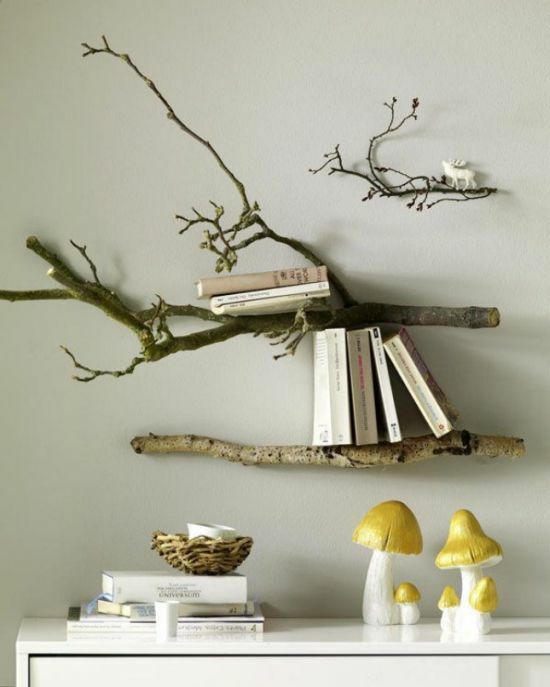 In the first image, you will see a creative branch decor item gussying up the table. It looks vintage and very pleasing. There are other ways to use these elements like crafting twig shades for your table lamps, or making shelves to keep many decorative accessories. 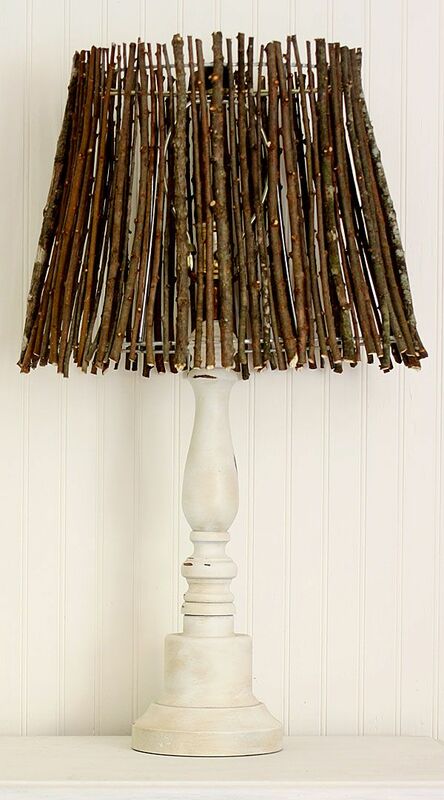 You can have these twigs polished, or just keep them natural for a vintage look. 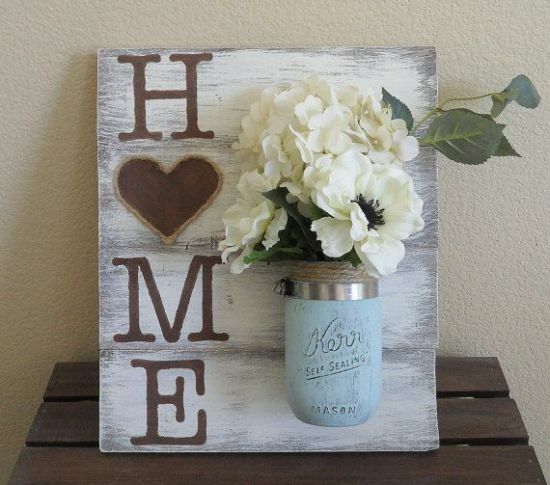 Mason jars are an all time favorite accessory for adorning DIY styled homes. Seldom would you find any house that is not embellished with mason jar decoration, one way or the other. The reason why most homeowners decorate their homes with mason jars is their charming look, cost effective factor and easy availability. For a vintage themed home decor, mason jar ideas like the ones rounded up below will help you immensely. You can create many awesome looking centerpieces using mason jars, like fill them up with water, or flowers or even tea lights or candles. 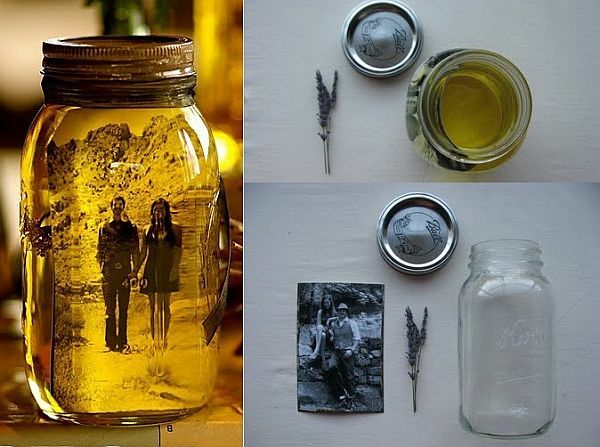 A mason jar photo centerpiece can be made easily using an old picture that can be plastered or glued onto the surface for a vintage look. Wall hangings with mason jar and a surface made of wood can do wonders to your living space. For your kitchens, you can utilize old mason jars to be hung upside down and used for storing spices and other condiments. Gardens can be given a face lift by placing mason jar containers with fresh flowers or herbs. Other DIY home decor ideas include making DIY vases, or terrariums. Here is an open invite for our dear readers to feast their eyes on creative DIY decor ideas using natural driftwood. Like we have mentioned before, natural elements help in creating a perfect harmony in the house, and the best ways to decorate your interior or exterior is to go all woodsy! 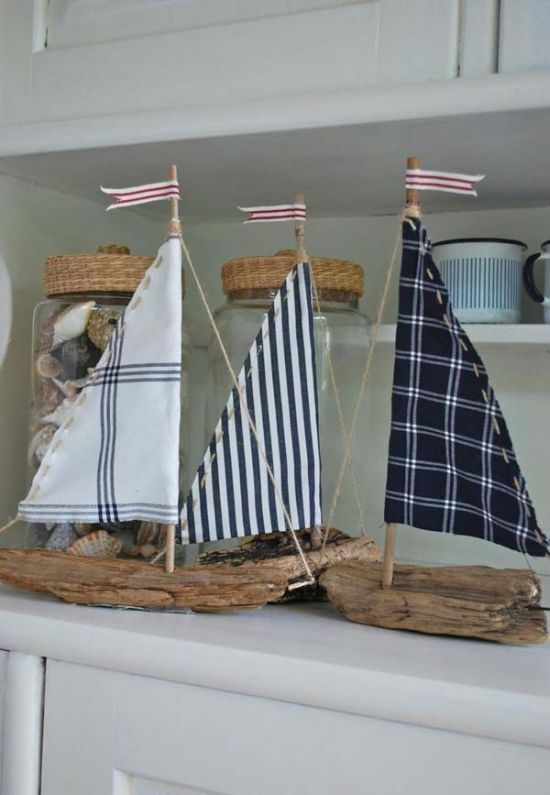 Yes, driftwood has been a decor phenomenon for quite some time, and its charm would never fade simply because it lends a vintage look to any decor. 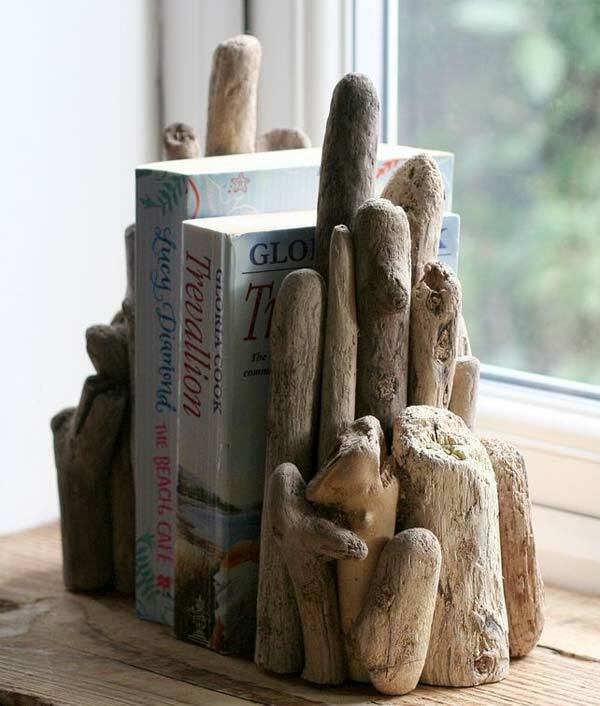 Simply add other style accessories or elements to a driftwood and you are good to set up a unique looking vintage home. 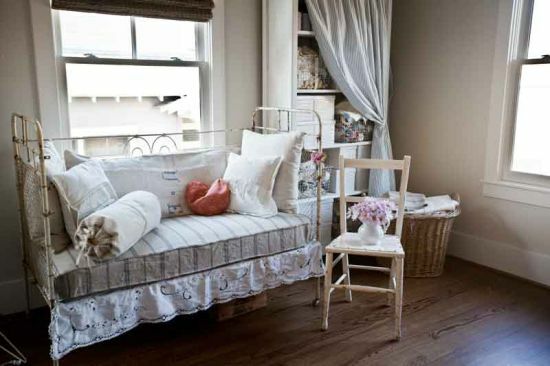 These include the use of burlap, fabric, twine, twigs, or lace. In most of the projects involving driftwood, the homeowners have very little or nothing to add on since this wood is crafted by mother nature and has a sheen unmatched to any other texture. Create awesome driftwood sailboats and gussy them up with ropes, or twines or vintage fabric. Bookcases with driftwood too look unique. 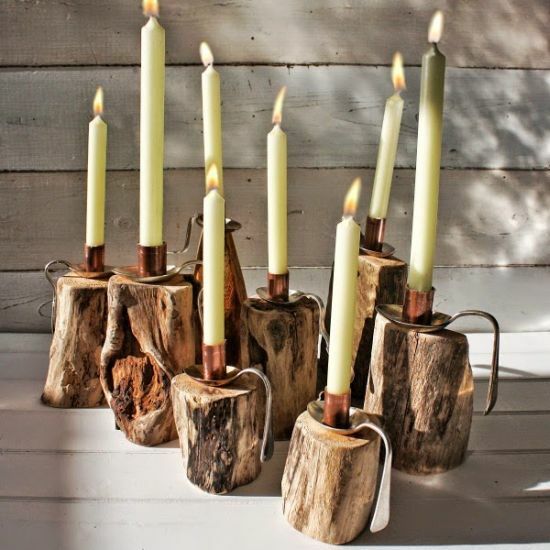 Candle holders made out of natural unpolished driftwood can add much life to your plain looking home decor. If you think, we were not going to include writing about suitcase decor, then, you have been pretty naive, we must say! 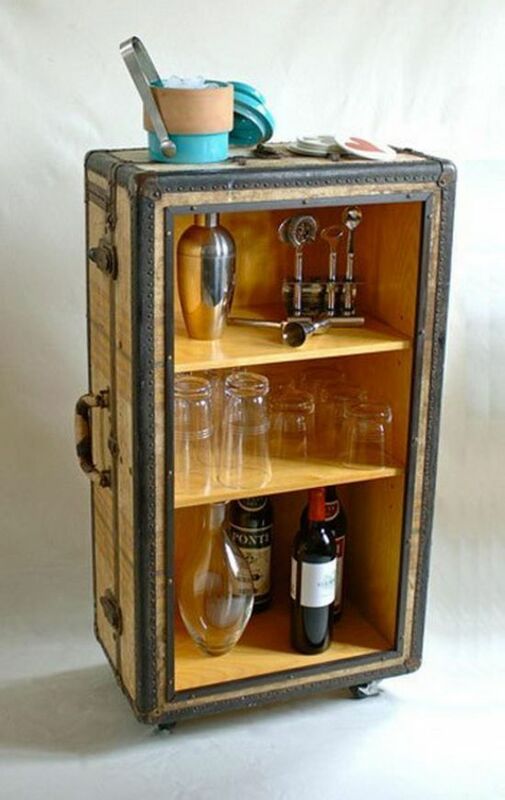 Given below is a gallery of beautiful vintage style home decor involving the use of old and unused vintage suitcases. 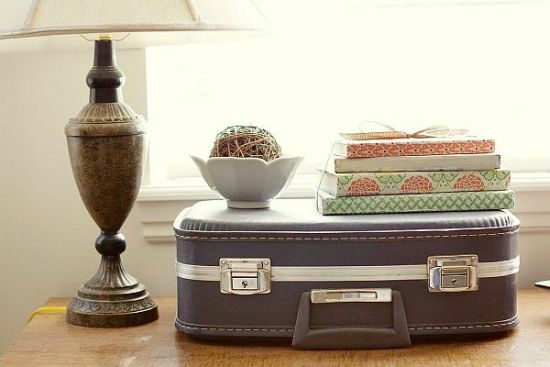 When we speak of DIY and vintage, how can we forget mentioning about cool decor ideas involving suitcases? 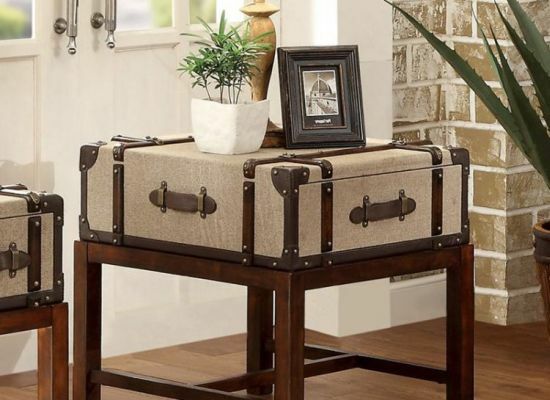 The good old suitcase in any form or shape or color always inspires us to craft creative decor ideas like end tables, console tables, racks, shelves, rolling bars, and what not. If you like quirky decorations inside your home, you can keep a place designated to be adorned with stacked up vintage suitcases. Suitcase sofas or chairs too would add fun to your decor. Try at least one of these crafts and see how you grab accolades from peers! 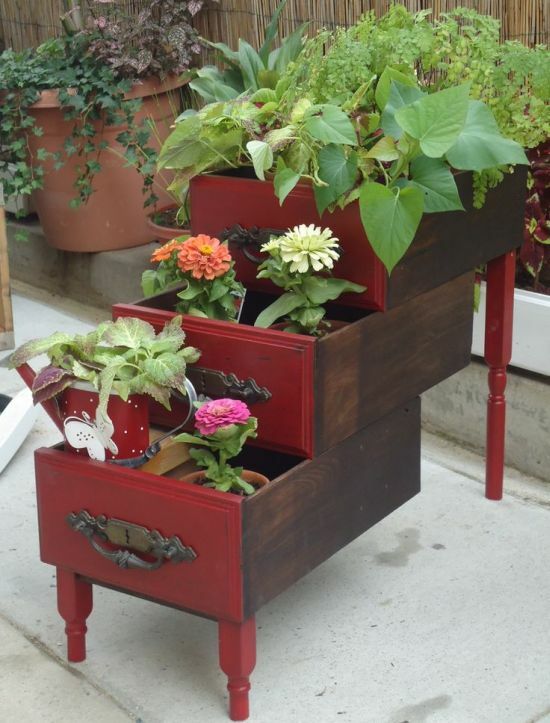 Old dressers that are usually found in attics or garages can now be transformed into something beautiful when you try some of these super creative DIY ideas. 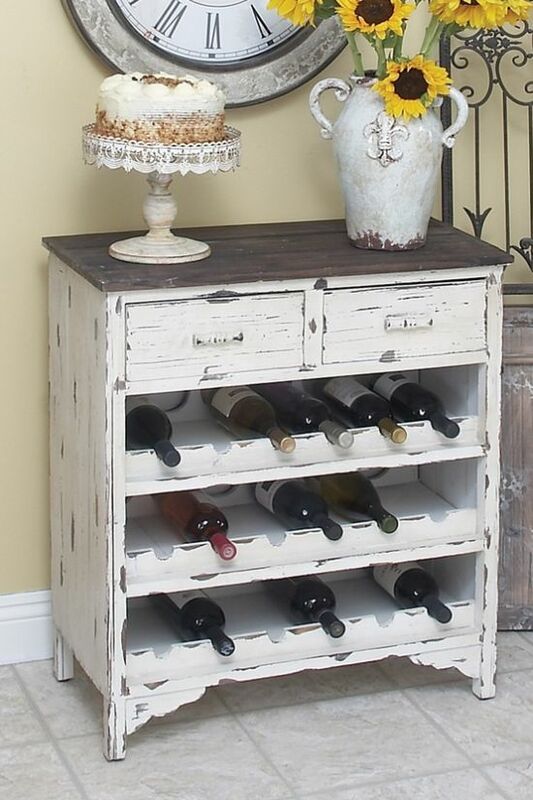 If you have been looking to buy a place for storing your wines and drinks, try building a cabinet out of an old dresser yourself. Yes, its very easy and will not drain your pocket. 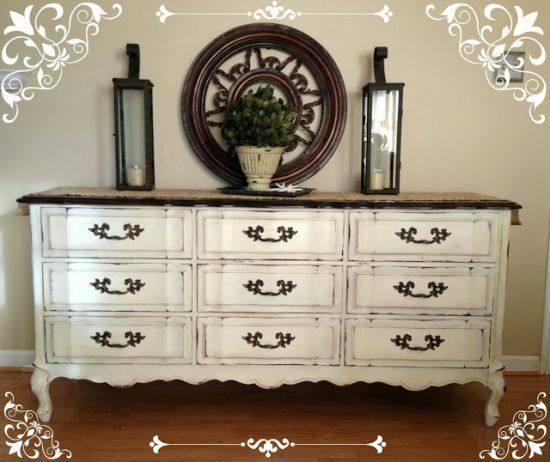 For a vintage looking cabinet, go in for unpolished look. The whole dresser, if need be, may not be used for such decor purposes. Instead, you can simply pick the drawers from your dresser and re-purpose them to be crafted into plant holders, or decorative racks. An unused nook in your living room can be decked up with an old dresser that’s painted with vintage chalk paint. These days DIY home decorating can be taken to conquer everyone’s interest when you offer creative and innovative ideas that were never seen or heard previously. 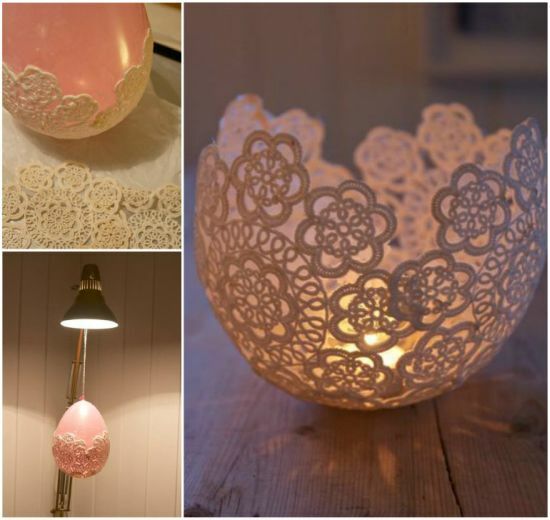 One such decor idea is to use doilies as decorative features in homes. 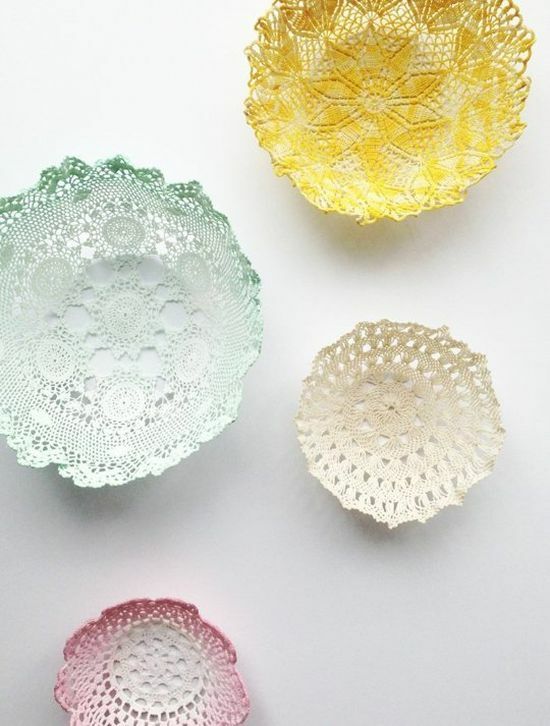 Doilies are a common element or feature seen in people’s homes, and now, there is scope for you to utilize these into crafting adorable looking pieces for your homes. Why just gussy up your tables with old doilies when you can decorate walls, jars or vases uniquely? 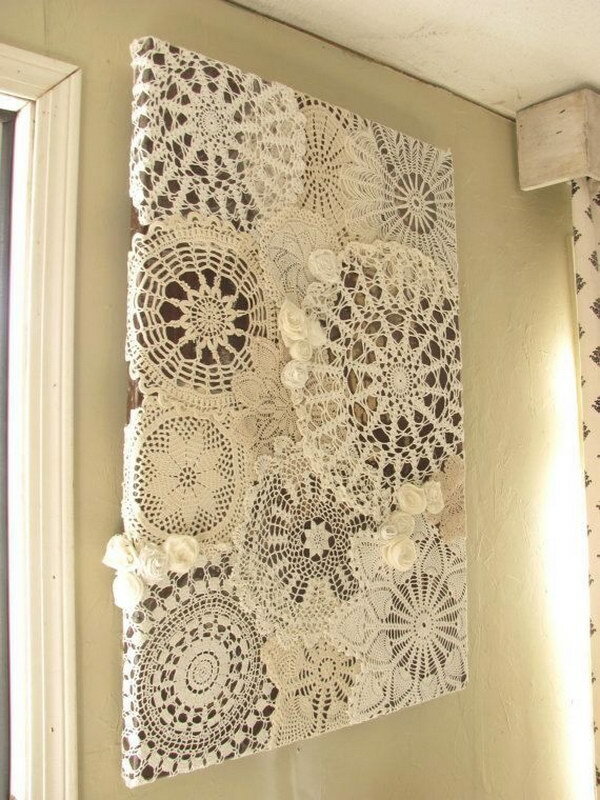 Well, take help as we are about to round up a few cool images that show houses being adorned with vintage doily art. 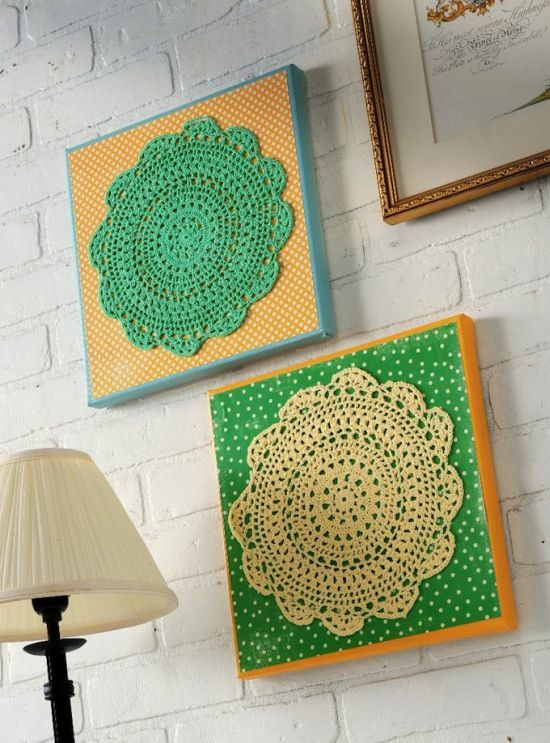 The wall of one house has been shown gussied up with spring doily wall art in amazing shades of green and yellow. The look is extremely fresh and will brighten up your interior. 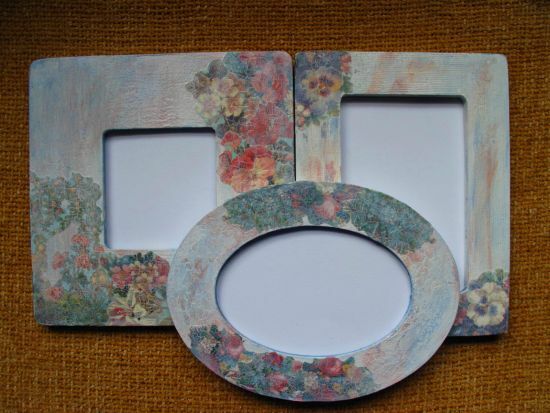 Other wonderful crafts to be tried are doily wall art with frames, doily candle holders and doily bowls. A candle can offer a unique look to any house’s decor, and is mostly seen adorning living rooms and bedrooms of folks. Why not give a little antique or vintage touch to your home decor by crafting DIY candle holders at cost effective prices? If you want to save big bucks but still wish to achieve a glam look for your living space, try out these decor ideas that are simply mind blowing. 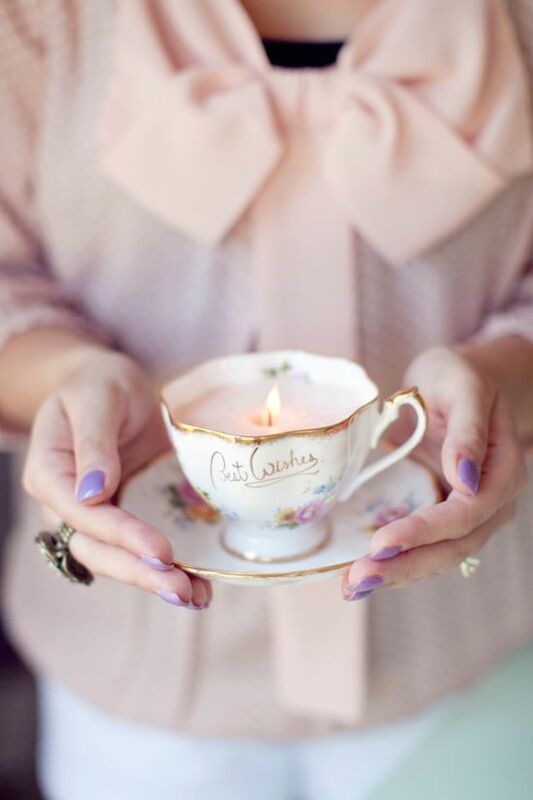 One of the most good looking candle holders in the photographs is the teacup candle holder with vintage accents. 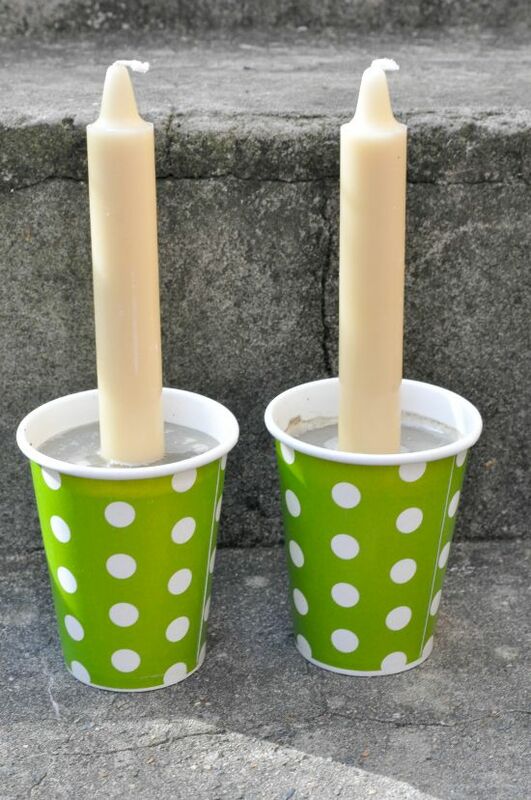 Seen also is a beautiful looking polka dotted paper cup candle holder that looks very pretty and can be placed anywhere in the house. 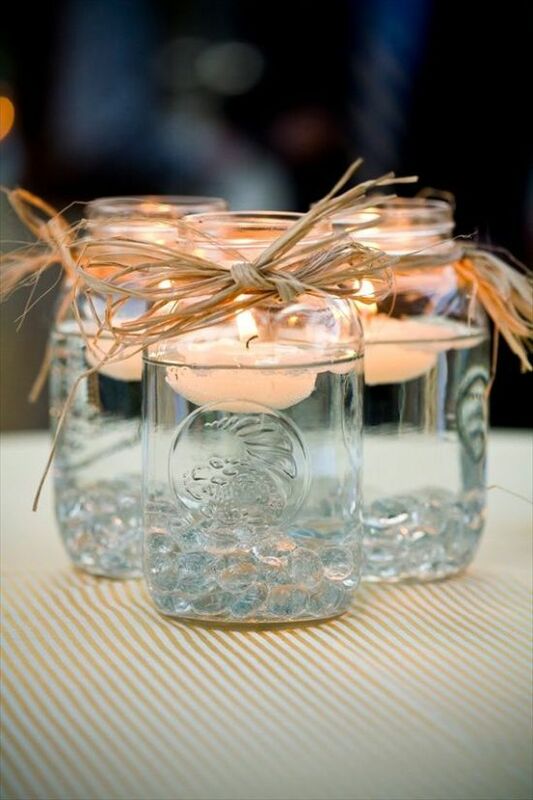 Bottles or mason jars too can be crafted to be used as candle holders. For a vintage look, try dressing up your votives, or vases or bottles with burlap or lace and then fill candles, either tealights or floating. 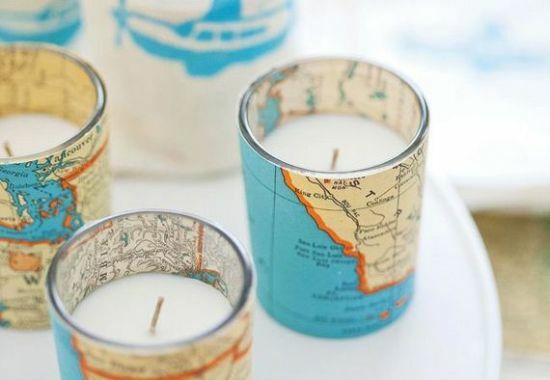 The below showcased gallery of DIY home decor ideas with candles are head turners for sure! Vintage decor ideas with old frames are very much in flavor and are being used widely by people all around. Why, you may ask? 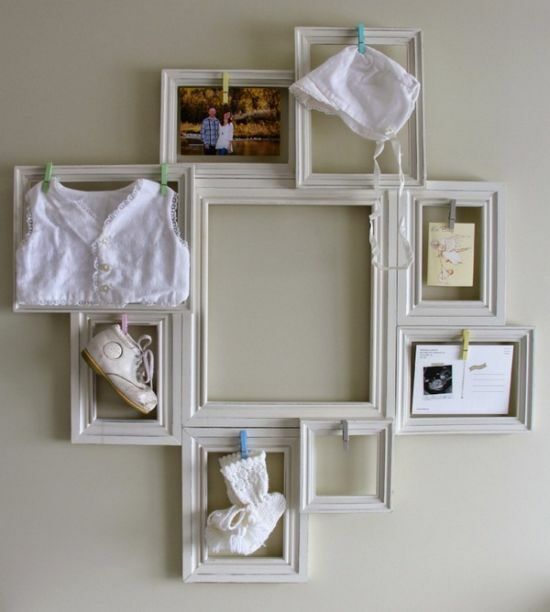 Well, frames as such look dull and pretty plain, and people want to try something new and innovative. So, in case you wish to add more fun and excitement to your home interior, make old frames the center of attention by crafting them into masterpieces such as those shown below. You can stylize your walls by hanging ‘frame art’ like one of the images shown here. For a vintage take, choose pastels like pink and white. 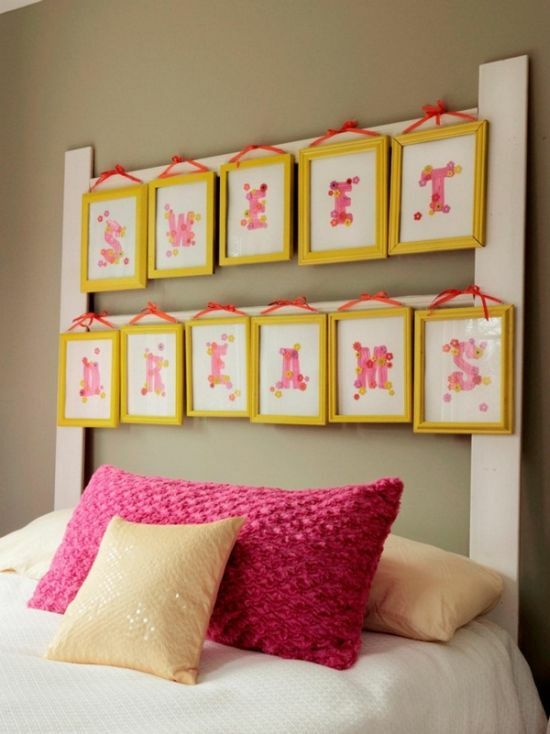 The headboards of your beds can be adorned with vintage DIY frames in light shades. 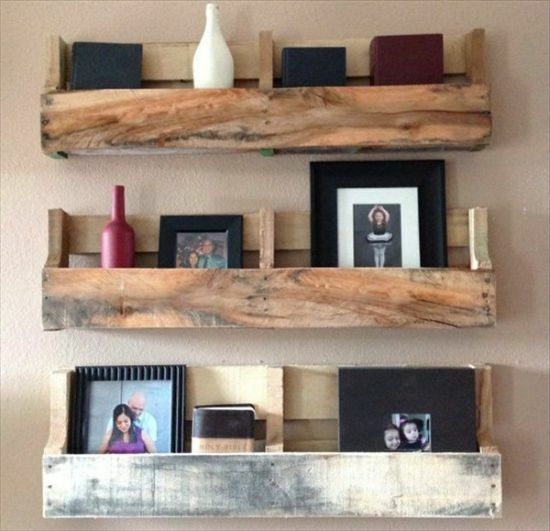 There are other ways to use old frames to be crafted into useful yet beautiful art. 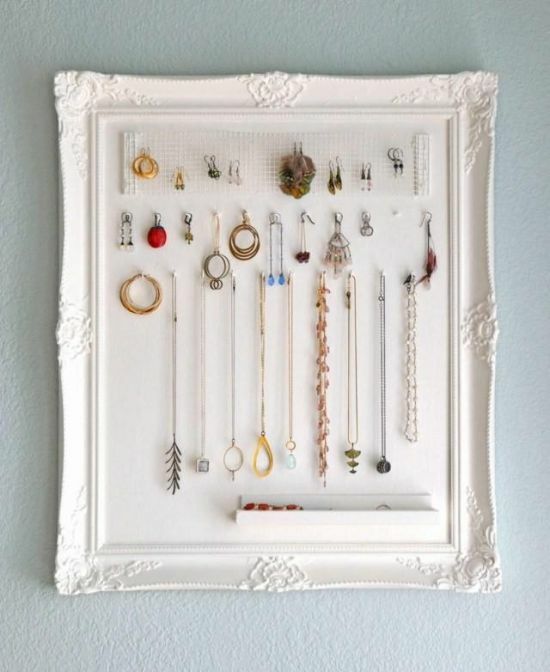 Take for example, a jewelry holder made out of an old white frame. Vintage style home decor carries with it a peculiar charm that can please anyone! How about trying DIY flowers to be used to embellish walls, tables, vases, candle holders, or bottles and even lampshades? Well, you have just arrived at the most unique website that is showcasing cool decor ideas using DIY. For a vintage look, there are plenty of elements to pick, for example light colors, natural features and recycled stuff like paper. 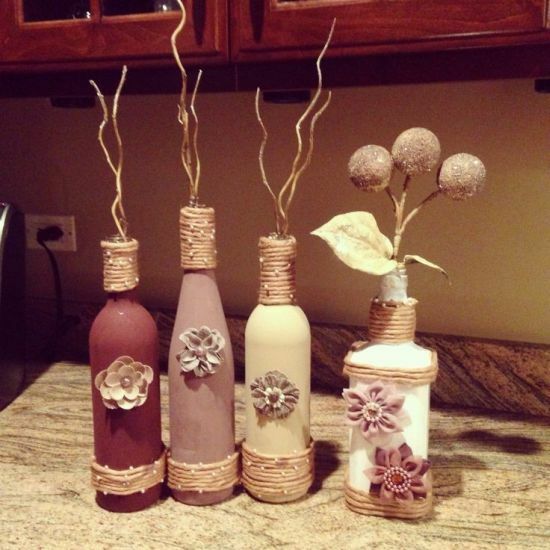 Burlap flowers can be crafted out and then added onto decorative vintage vases or bottles. 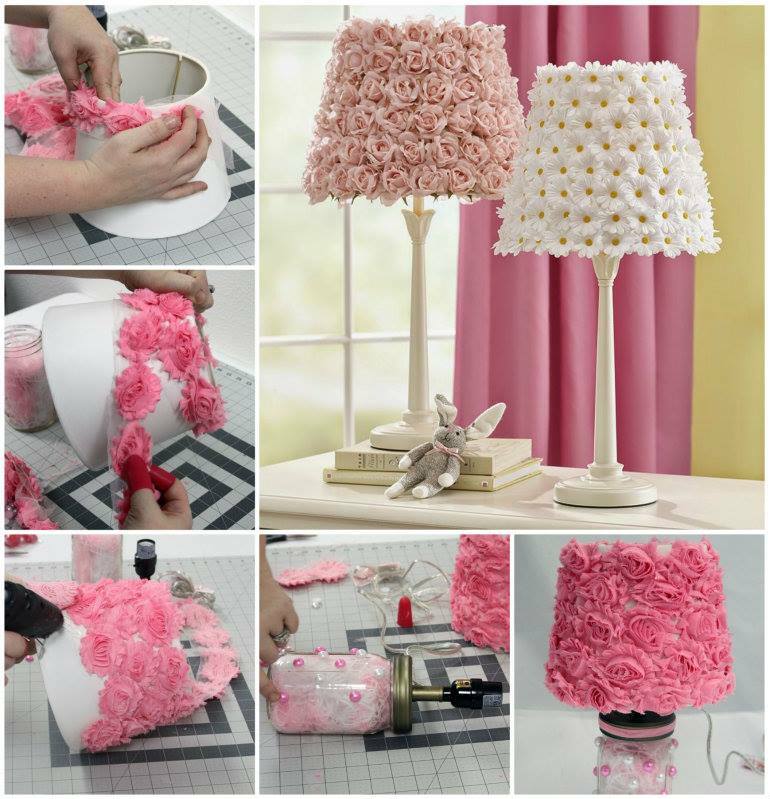 Or, you can also create an ornamental lampshade by pasting flowers crafted out of paper or fabric. Twine or branches can too be used to make DIY flowers and then pasted on decorative accessories. Hope you all had fun reading and looking at these wonderful decor ideas involving DIY. Some of these are readily available, while a few might have to be bought from thrift stores. Pick one…two or all as each one of these DIY home decor ideas will spice up your homes. Enjoy!